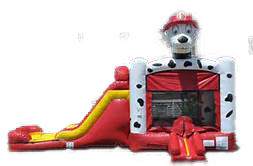 Planning an unforgettable party is easy with the Dalmatian Combo bouncy house! This bounce house and slide combo is 25 x 17 and requires a 30 x 20 setup area. No matter how old your child is, he or she will love this bouncy house. It’s perfect for all ages! Featuring a beloved Paw Patrol character on top, this bouncy house is sure to please any Paw Patrol fans. The Dalmatian Combo bouncy house and slide is a kid favorite! Kids cannot wait to go play around the inside of this unit with Marshall from Paw Patrol up top. It also features a basketball hoop on the inside, as well as a slide to exit the unit. Hours of fun are guaranteed with this unit, and it can be set up on grass, concrete, asphalt or dirt; though, we recommend choosing a grassy 30 x 20 area.